Acrylic or glass furniture has long been a designer trick for small spaces. They serve a purpose (i.e., holding drinks, etc.) while basically disappearing into the space. The result is a room with all the function you need, but without all the visual clutter. Hate your low ceiling? Take a good look at these walls in a home decorated by Sheer and Company. See the subtle vertical stripes? They make the low ceiling in this compact living room seem higher. The main goal of any small living space is always to use every area as efficiently as possible. So that area under the coffee table (considering yours doesn’t have shelving) can often feel a bit wasted, unless you mimic this clever space from Style Me Pretty Living that tucks additional poufs under for more usage. While some might tell you that all-white rooms are the key to stretching a small space, we’re here to tell you that no matter what paint you go with, the effect of color is a lot more nuanced than that. A trick that always works, though, no matter what’s on your wall? Matching your drapes (bonus points if they’re a sheer material) to your wall. Here, from Better Homes & Gardens, off-white walls seem to go on forever as the visual line is not interrupted by different colored curtains. If you flip this and decide to go dark and moody, stick to draperies in equally dramatic tones for a super cohesive, polished look perfect for a small living room. Are you starting from scratch? The living room in this 600 square foot apartment decorated by Havenly reveals a simple formula for small space decorating. Designers Cloth & Kind opted for an impressive statement wall when it came to this petite space featured on Architectural Digest, and the mix of patterns is fresh and lively, while a subtle, neutral palette keeps things from feeling overdone. This is a genius way to inject serious personality into a small space. Sometimes the best way to visually increase the square footage in a space is to keep the eye constantly in motion (so you don’t notice how small it is). Take a cue from entertaining expert Lulu Powers in her LA bungalow seen on One Kings Lane: pattern on pattern, bold color next to bold color—cozy perfection! Packing your teeny space with lots of purpose is another way to trick yourself into thinking things are bigger than they appear. In this apartment on Homepolish, the living room seamlessly connects to an office area, feeling cohesive and interesting. If you’re looking to add storage/display surfaces to your living room, consider going leg-free and attaching units directly to the wall (like this Besta unit from IKEA in a room via Livet Hemma). Floating large pieces like this tricks the eye into thinking less space has been taken up because the floor area is still free (plus, you can use that newly found space for even more storage should you feel the need). An awkwardly shaped living room can be baffling to decorate. Here’s what to mull over if you’re working with an odd space. How so, you may be thinking? Many Midcentury designs like the dining set shown on the left, are low-slung and leggy, which looks proportionally better in little rooms. Use two small tables to take the place of one big coffee table. They’re better for traffic flow and easily moved to wherever else you may need them. 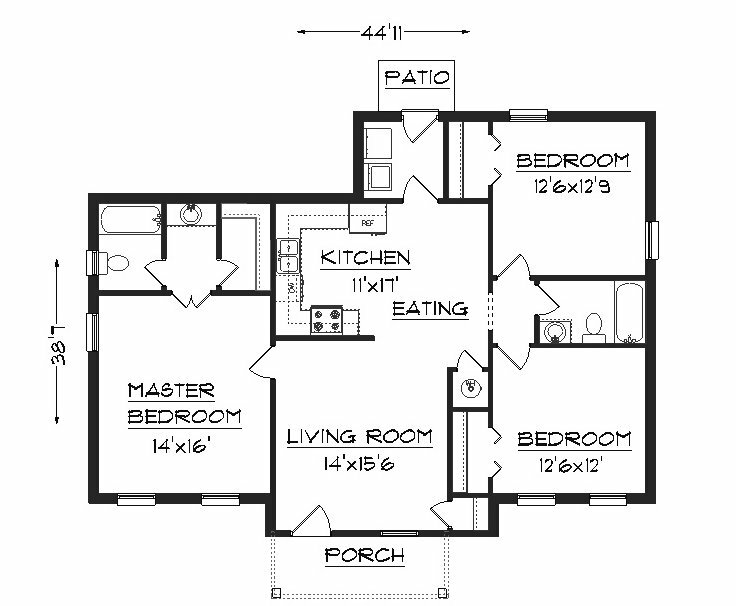 Those pesky small living rooms always have us stumbling and second guessing what we should do to make the most of the floor plan. If you’ve ever struggled with how to arrange your furniture, how to fit in more seating, how to get in more light and beyond, here are 30 rooms—from genius teeny spaces full of inspiration to larger living rooms with plenty of ideas to borrow—showcasing the best ways to expand your square footage without any demolition. Light curtains and shade help maximize the light in a small living room. It’s even better if you can match them to your wall color. Turn a cramped living room into a boho haven with fabric. Houseplant expert Igor Josifovic, piles on the textiles in his tiny living room. A cotton tapestry and Kilim pillows dress up a budget sofa. 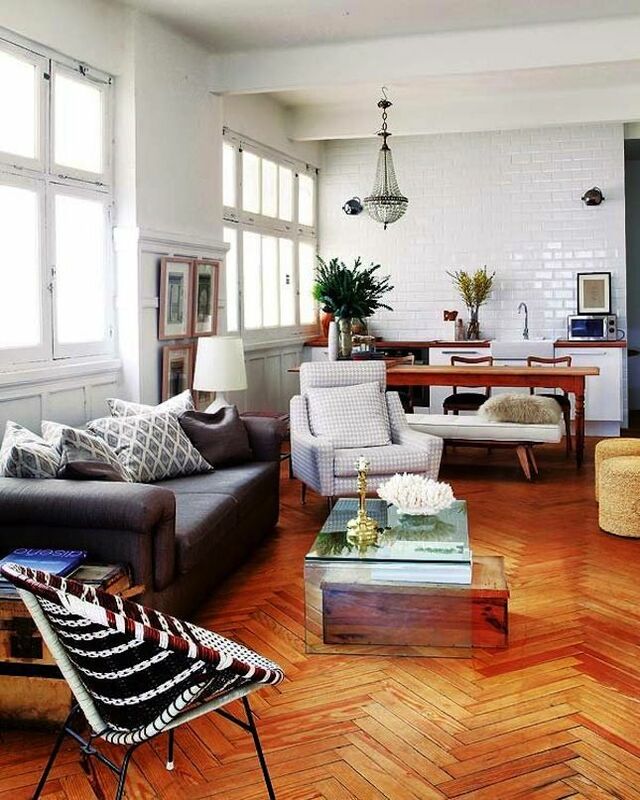 We love the Turkish rug that makes sitting on the floor more inviting. Next to the woven wall hanging is our favorite décor tip: see how Igor framed a kitchen towel that was too cute to use at ​Happy Interior Blog. 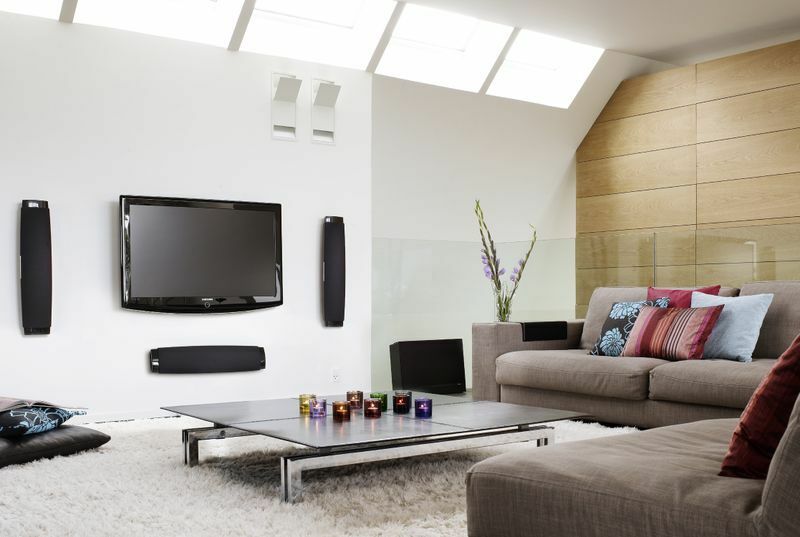 A lower couch creates the visual effect of higher ceilings. Just add pillows to make it more comfortable for lounging. A feature wall is a great way to properly weigh and focus a room with awkward angles, like in this room from Alvhem, that uses a bold floral wallpaper to pull the attention to the seating area. In a tiny space, you might be afraid of overwhelming things with too-large furniture, but oftentimes, if you go full throttle with a large sectional that hugs the walls, you’ll get a room that #1 seats a ton of people and #2 feels super welcoming and cozy. Take notes from this home we toured in the UK that fits a family of four. Spotted on Marie Claire Maison, this non-traditional “sofa” is perched atop vintage storage bins—chic and smart! To turn a small, sort of sad living space into your favorite room, consider taking an empty wall and turning it into a top-to-bottom mini library. It’ll provide plenty of storage opportunities, but also makes such a statement and gives a luxe built-in effect. For an even more stylish push, pick a rich color, like the hunter green of this room, and add molding to polish off the custom look. In this space by The Apartment St Kilda via Instagram, the crisp white walls serve as the perfect canvas for the oversize jet black lighting fixture and delightfully worn-in furnishings and accents—you hardly notice the room’s tiny footprint amidst the cohesive palette. With a rug that is. A large rug like this one in the West Village apartment of Lee Lenox makes a tiny space feel much bigger than it actually is. This living room feels big and spacious due in large part to tall ceilings and big windows, but also of note is the layered lighting. Keeping light at multiple levels (via floor lamps, chandeliers, and task lights) creates a moody yet well-lit room. Are you looking for a super easy decorating idea? Nothing prettifies a living room like plants. Blooming perennials like daffodils or tulips add lovely color, while leafy beauties including ferns and spider plants bring interesting texture (plus they clean indoor air!) Got a black thumb? Try a few low-maintenance options from the succulent family and put them in cute DIY planters. Okay, so this one is reserved for homeowners who can invest in custom solutions, but how enviable is this media center designed by London-based firm Sigmar? For character add pops of colors and splashes of texture. Interior designer, Mercedes Daczi personalized this white living room with a range of colorful and textural accents including houseplants and wicker furnishings. Keep it simple, sweetie! When you don’t have a ton of room to play with but you want to inject some color, it’s best to keep it simple if you’re a newbie. Start with a foundation of neutrals and add in one feature color and one metallic and run with it, like this space via House Beautiful which invites varying textures and finishes to add depth while remaining light and airy on the eyes. Similar to the above trick, choosing accent furniture with delicate frames is another way to keep down the visual noise. This tiny seating living room (the home of content strategist Cole Wilson via One Kings Lane) feels full sized thanks to the delicate gold base and glass top coffee table, thin framed accent chairs and floor lamp. Dark, glossy walls create a sophisticated backdrop for simple, clean-lined pieces. Use the small space to your advantage and make it feel like a jewel-box. Don’t let your small living room pinch your style. So what if it’s a tiny white box with zero crown molding? Or it’s scarcely big enough for a regular size sofa? No matter how small, it can still look stylish whether you own or rent. To prove our point, we gathered the best décor tricks for personalizing the most lived-in spot in your home. Here are 17 small living rooms that work beautifully. Draperies are the quickest way to add instant height to any space. The trick is to hang them from right around where your wall meets your ceiling and let them slightly puddle on the ground, as seen in this Notting Hill townhouse via Suzy Hoodless. This space from Cup of Jo is by no means a small living room, but let’s pretend for a second that it is to learn a thing or two from it. See those two poufs on the other side of the coffee table? Those could easily swap in for the actual coffee table itself in a tighter space, which gives the room’s user flexibility in surfaces. Opting for ottomans or poufs over larger furnishings is a smart way to still have a spot to place a drink or remote, but be able to move things easily around as you please (and even maybe create more seating). Here’s a teensy living room that beautifully illustrates shabby chic style noted for its light colors, white slipcovered furniture, and vintage accents. From the comfortable love seat to the pink Fleurette armchair, the enchanting touch that completes the look is the fun-size chandelier. Before Scandi style became au courant, shabby chic ruled. But that doesn’t mean the once wildly popular décor trend is passe. When floor space is at a premium but you’ve got tons of books and whatsits to store, you’ll want to consider floating shelves. Keep them the same color as your wall for an even sleeker look (and don’t be afraid to get creative with sizes, like these scattered smaller shelves in a room from VT Wonen). You can turn a weird wall into a focal point. The owner of this apartment turned the vertical space around her bedroom door into a salon styled gallery wall. The small living room in this luxe London apartment designed by David Long is the epitome of regal chic. A silvery-gray palette sets the stage for a layer of beautiful accessories in rich colors and lush fabrics. The cherry on top is the commissioned portrait that makes the room feel bigger by drawing the eye up. Get a closer peek at David Long Designs. When it comes to decorating rooms of all sizes, an alpha object is what anchors a space. In this living room decorated by IDF Studio, it’s the plush pullout sofa, which doubles as a guest bed. The nesting tables and upholstered storage ottomans also have dual purposes for entertaining and hosting. The best way to shake up a space is to give it a fresh furniture layout. If you’re bored of your little living room, consider angling a few key pieces to keep things interesting like this room on Domino (via Airbnb). Use ottomans in place of a traditional coffee table to make better use of your space (because, let’s face it, a tiny house means your living room often does double or triple duty when people come over). You can top them with a tray to hold flowers and books, or call them into use as extra seating. Try implementing varying geometric and linear prints, as seen on Design*Sponge. This gives a small space a sense of structure while also providing the illusion of additional length and width. 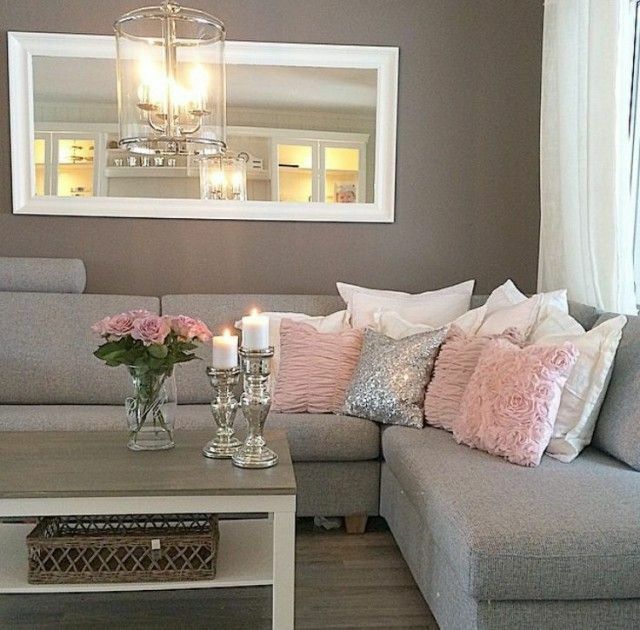 First, stick with low profile furniture (as we mentioned earlier) in neutral colors. Leggy pieces like the coffee table create a sense of spaciousness because you can see more of the floor. For pops of color add a houseplant or two and patterned rug. Next, fill that big blank space over your sofa with a statement-making print or oversize…MORE mirror. Need a floor lamp but don’t have an inch of horizontal room to spare? Consider something wall-mounted. How do you give a room with no crown molding a little architectural detail on the cheap? 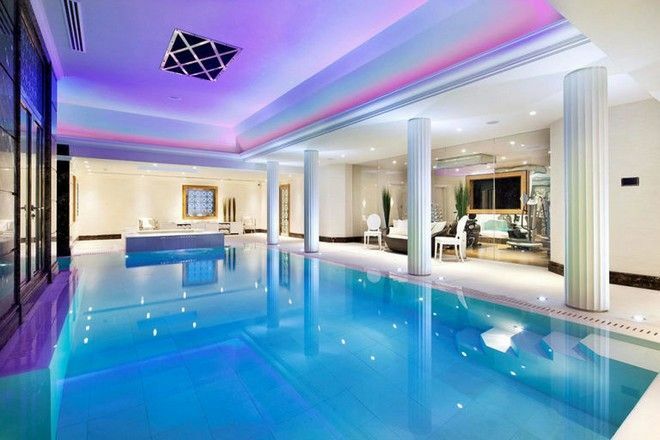 Feast your eyes on this showstopping feature wall by interior designer Joe Human. It’s purple paint with yarn on top. Not sure where to put the sofa? A bold pattern can establish a center point in an oddly shaped area. Here peonies wallpaper anchors the living room. It’s no secret that plants add so much value to any room in the home, but you can really get creative with them in your living area. In a tour of her home via House Beautiful, Justina Blakeney shows off just that in her compact living room, and is smart about hanging greenery as to not take up any precious floor space. A living room that’s both narrow and small can be particularly challenging to decorate. 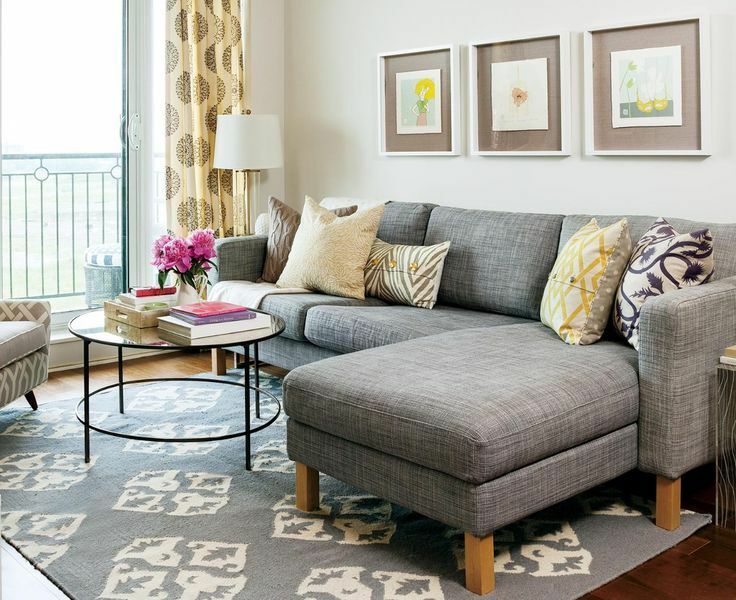 In this bright and airy space redone by Decor Aid, a sectional sofa makes the most of the precious square footage. If you have some windows in your tiny living room, put those window sills to work holding books, plants and other decorative objects. In this charming living room via Domino, your attention is occupied and delighted by all the personal accents and accessories that draw you into each area of the little space. We’re so conditioned by the living room formula sofa + coffee table, but what if you focused on doing what works for you and how you live instead? In this space from IKEA via Domino, a quarter of slipper chairs sit where a sofa might be (how modular!) while a coffee table is absent in place of a rolling cart off to the side and cushy floor rugs. Don’t be afraid of oversize chairs. Lots of little things in small spaces can make the room feel cluttered, so stick to a few larger pieces for comfort. Mirrors are one of the best ways to make your tiny space feel open and airy. This space from West Elm shows off the dramatic impact multiple mirrors can play, plus they reflect any and all light available in the room. The petite living room in this Paris apartment had us at bonjour. The teensy space triples as the dining room and kitchen too without feeling crowded or skimping on old world style. A few smart decorating tricks made it possible. Glamorizing a small living room isn’t a problem if you watch the scale of your furniture. For instance, an overstuffed couch will make any small space feel minuscule. However, an apartment size sofa that’s also close to the ground (as shown) will have the opposite effect. First, furnishing it with just the bare essentials, a sofa for lounging and dining set for eating or working, doesn’t squander a drop of square footage. Second, a small selection of formal embellishments from the crystal chandelier to the ornate mirror melds Parisian…MORE chic with practical function. You can rent this charming apartment at Paris Perfect. Can’t paint your white walls? Consider embracing a white-on-white interior. Pairing your walls with equally pale furniture is an elegant and straightforward way to make any small space feel brighter and larger. The elegant bike shelf keeps wheels up and out of the way while turning the bicycle into a decorative wall hanging. Another smart idea that doesn’t squander floor space is the floating desk that spans the left side of the room. Its built-in drawers provide a good deal of storage. But what transforms this 500 square foot studio into a cozy grown-up home are the…MORE various details and décor styles that add one-of-a-kind character from the colorful prints to the refined furniture. See more ​photos at Homepolish. This living room feels grander than its actual size thanks to low-slung furniture. But what makes this space so inviting is the mismatched furniture from different eras like the contemporary sofa and vintage leather chairs. Does your living room scream overgrown teenager? This small bachelor pad is brimming with tips for “adulting” an apartment. When the space is lacking, you’ve gotta get creative. This desk can become a dining table, making it perfect for entertaining. Keeping scale in mind is also important when adding the Midas touch. 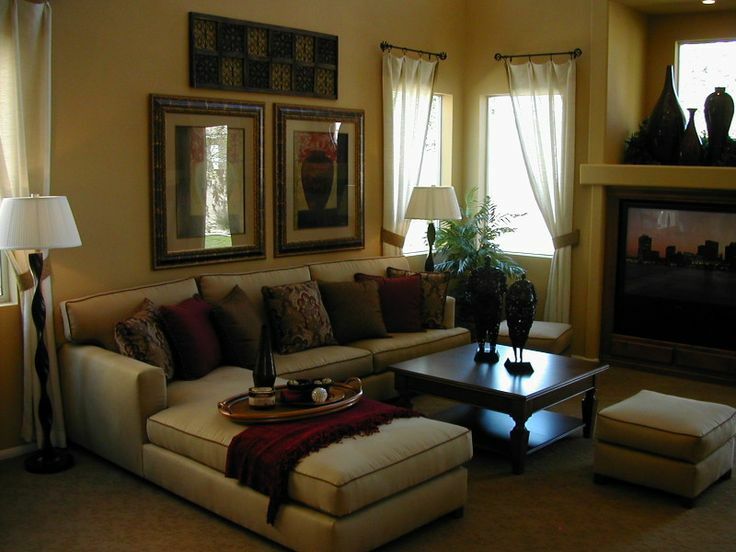 All of the gold décor shown in this small living room work with the low profile couch. But wait there’s more. See the transparent coffee table?…MORE Since it doesn’t take up visual residency, it creates the illusion of more floor space. There’s ​more to see on Havenly. If your living room is cramped and cluttered, the last thing you’ll want to do is hang out there. That is, unless you trick your eye into thinking your room is bigger than it appears. It’s not magic; it’s just smart styling. Get ready to Pin all these tips. Blankets are a must for a cozy living room experience but when you’re short on space to store said blankets, you don’t have many options. Sure, you can stash them in a basket, but that takes but valuable floor space. A better option? The leading ladder (as seen here in the home of shelter bloggers New Darlings). Curtains hung well above a window add airiness and height to a small room. Keep the curtain design basic but use extra fabric for fullness. Hammock chairs are super trendy right now, but they’re also a life saver in a small living room. You can add seating without taking up a ton of floor space, like you would with a traditional armchair.